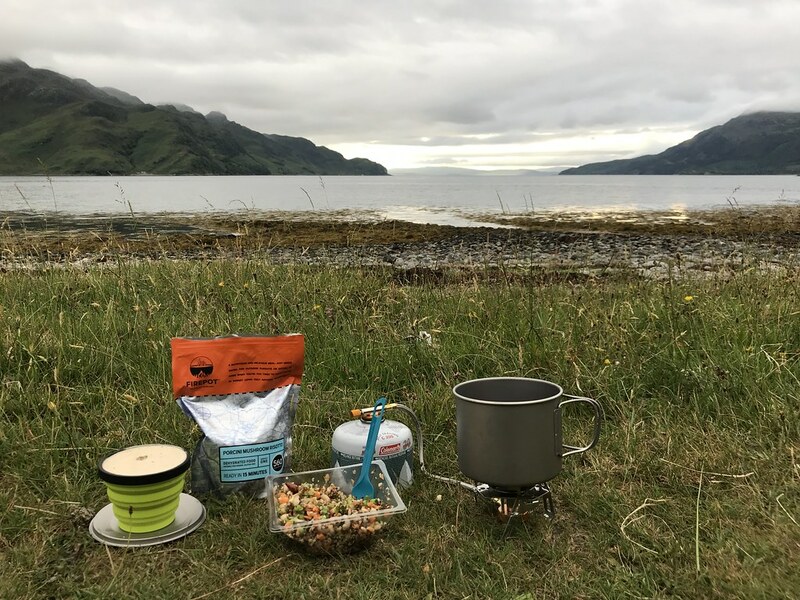 Our ambassador Kelly has been exploring Scotland, ticks, midges and all. She left her Rocket at home and took the Escapade instead. She tells us about it here. 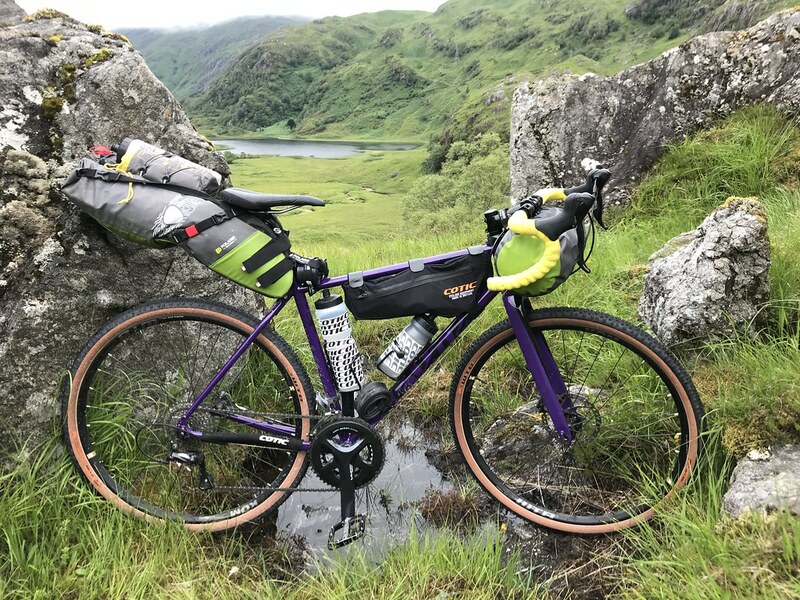 When asked if I was free to join a bikepacking trip in Scotland with Komoot and Cyclist mag, I practically jumped at the opportunity. Having got the taste for bike packing earlier in the year I was super keen to head out again on another adventure. This time with actual camping on the agenda, so no fancy air B&B for me. Fiola had planned our ride on Komoot which was a gravel ride, so the kind folk at Cotic loaned me their adventure bike for the trip, the Escapade, which has drop bars (YIKESSSS). Tyres wise I ran WTB resolute- they are cracking tyres and WTB aren’t wrong when they call them their ‘set-it-and-forget-it tire that keeps on keepin’ on ‘. My trusted and tested WTB women’s Koda pro saddle and Burgtec flat pedals. I didn’t fancy clipping in with all the weight I’d have on the bike (visions of me falling down some mountain side bike and bags attached, no thanks). Bike setup sorted, now for packing. I’d asked my good friends Hannah and Nicole for advice on what I should take as they’ve both been on far greater bikepacking missions than me, and it’s also good to get others tips incase you’ve forgotten something super important, like underwear (thanks Hannah). 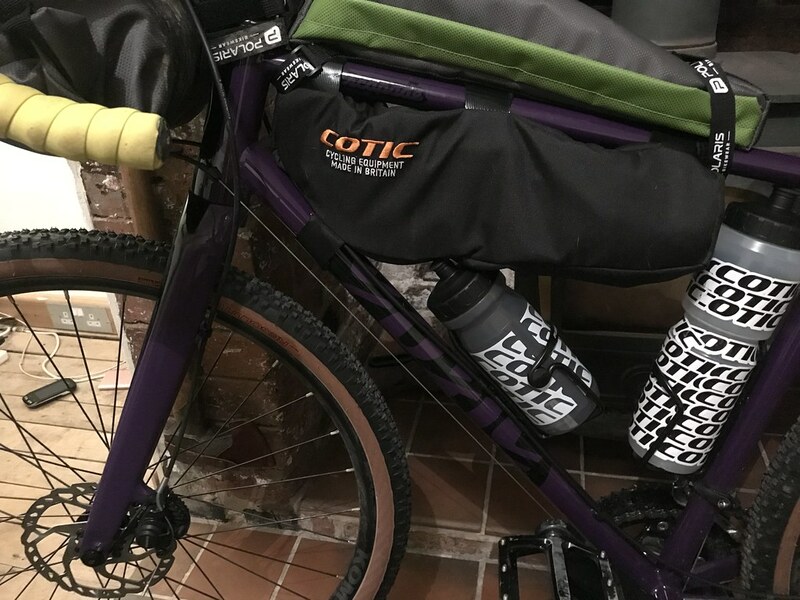 I have my brilliant Polaris bags to load up with all my kit, with an extra edition to the bag squad from Cotic, their new waterproof frame bag. So bike and bags sorted, all that’s next was the camping essentials. I have a small, very lightweight Outdoor Gear “backpacker 1’ tent, weighing in a just 1.3kg and also a super lightweight Forclaz sleeping bag that packs up super small and is 985g along with a Forclaz air matt weighing 500g. All of these I took out of their original bags and distributed them between my handlebar bag and seat post bag. Polaris’s handlebar bag is waterproof, so I put my sleeping bag, down jacket and spare clothing in there and the tent got stuffed into the seat post bag. All of this I squeezed into the seat post bag and my frame bag. As I mentioned before, Cotic have a new frame bag, and it’s flippin’ good. Due to it being waterproof, spacious and easily accessible I put all my electrical items, some snacks and my waterproof in this bag. Now that took a lot of effort to figure out with plenty of unpacking and packing, juggling and umming and ahhing about what I ACTUALLY needed to take, like hair curlers- there just wasn’t the space. All packed up I headed out for a nice drive up to Fort Augustus to meet the other riders, Fiola, George and Joe. Once we all arrived we sat and looked at the tour that was planned on Komoot and got a good nights kip before our adventure began. We woke up to classic Scottish weather, rain. Had breakfast, grabbed our bikes, admired the Fort Augustus canal locks and then we were off! GRAVEL RIDING? what exactly is that then? I certainly felt like I had the right bike for the job, but after a good million miles of canal path and road I can’t remember meeting the gravel. 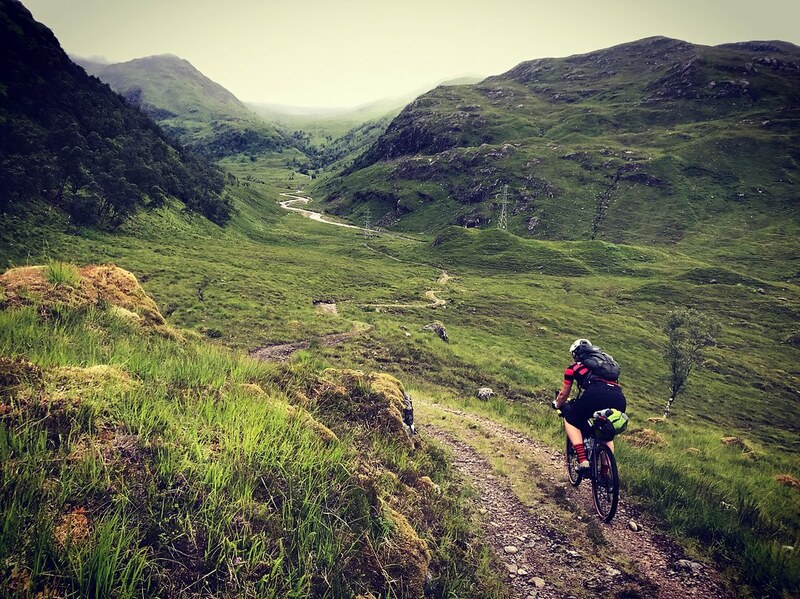 Scottish highlands are unpredictable and super harsh at times, so the first days riding took us all along some amazing lakes and then up a few incredible mountains. Mountain paths that were unrideable and nearly unwalkable at times, lugging my bike up them with bags in tow was a struggle to say the least, but the sweet feeling of success when I reached the summit made the pain train super worth it! On the descents the bags all remained very much attached to my bike as I hung on for dear life on the drops riding down the rockiest ‘gravel paths’ I’d ever seen! 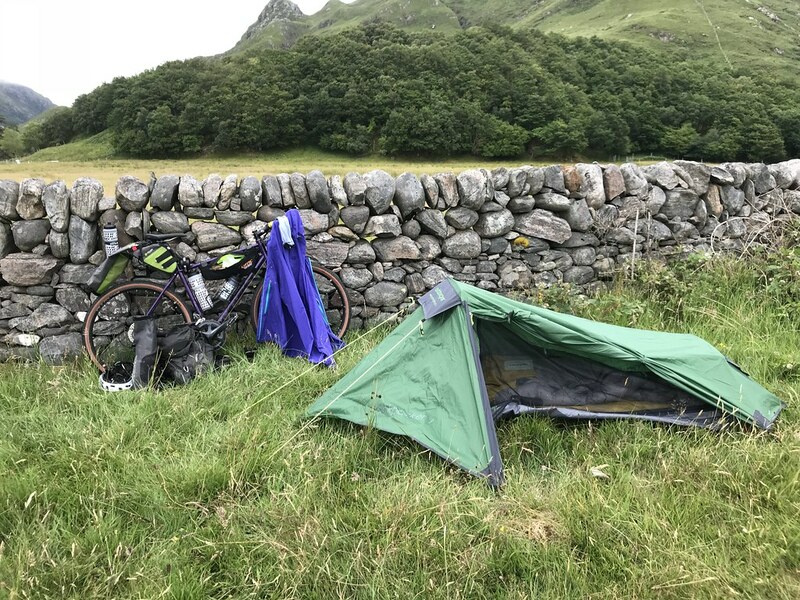 After a good 80k we arrived in a beautiful hamlet called Arnisdale, all pretty tired and hungry we set up camp for the night. This was my favourite bit of the trip. I’d packed THE best food and was cosy and content in my dry clothes. Tent up and fire lit we sat and enjoyed the sunset over the Isle of Skye before rolling into our tents for some much needed rest. The best nights sleep followed by a lovely coffee and bowl of porridge on the beach to set me up for the day, which luckily was a dry one! 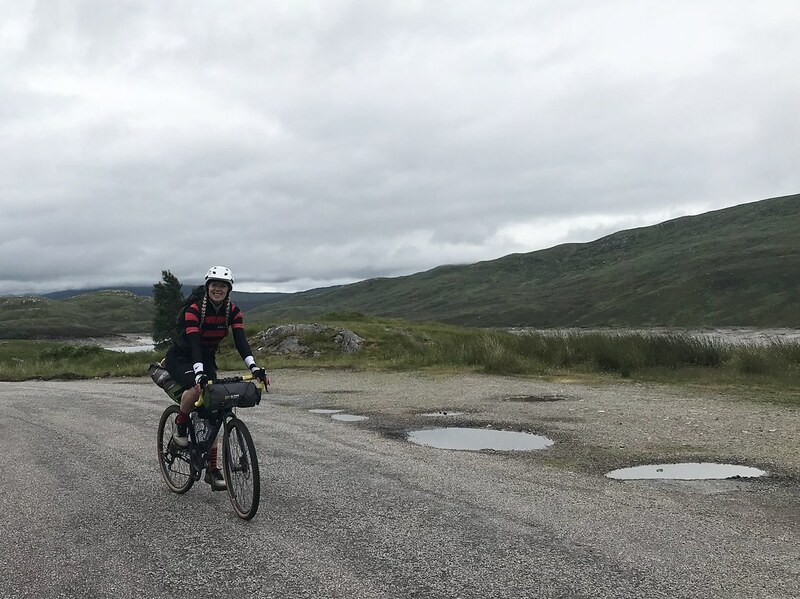 We made our way out of Arnisdale and stopped in a village called Glenelg to grab some more snacks, fill up our water bottles and look at the days route. Sometimes it doesn’t matter how much you plan for a trip, some things just don’t work out! 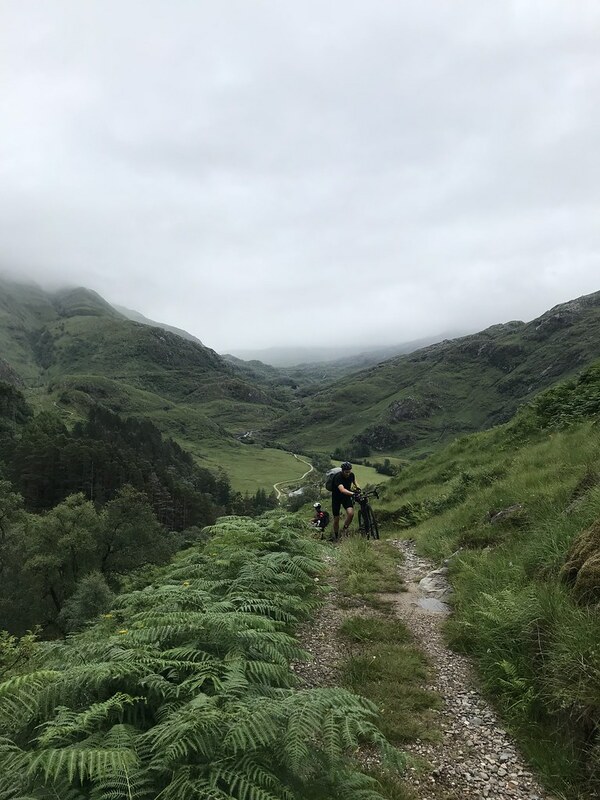 After the mega first day riding, we came to the realisation that we were going to be struggling for time to get back to Fort Augustus on these ‘gravel paths’. Fortuntely Komoot makes it super easy to re-route a trip, so that’s what we did. This meant however A LOT of road to cover. I don’t have much to say about this part of the trip…but what I will say is, forget the views and ‘training’ I am not a road rider and I never will be. Singing ‘Walking In Memphis’ and ‘Fall At Your Feet’ at the back of the pack was keeping me going and then some ‘Tubthumping (I get knocked down)’ ft Fiola was also a distraction from the dismay. (I only cried once). 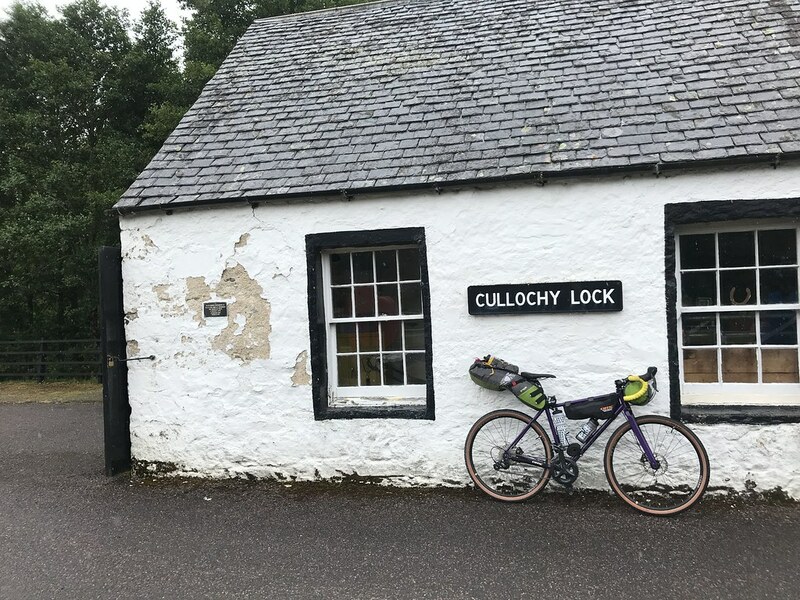 During our Scottish A-roads tour we stopped off at a nice pub, the Cluanie Inn where we enjoyed a coffee and some cake and then removing over 20+ ticks from mine and Fiola’s bodies. Already struggling on the roads the last thing I needed was some new pals trying to hitch a ride. AHEM, after an interesting I don’t know…80k? We finally made it to some GRAVEL ROADS, so the last 12k of our ride was pretty nice, up and through some forests with lovely views down the valley. 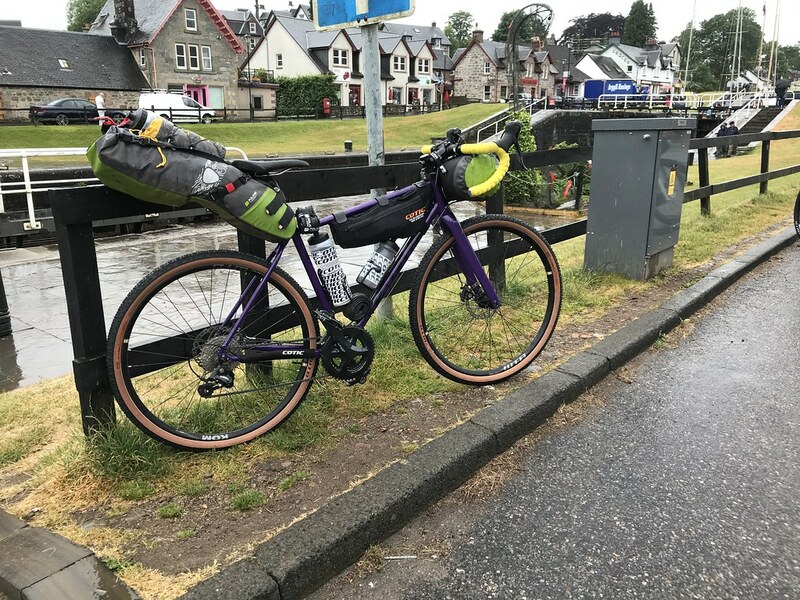 We arrived back in Fort Augustus and treated ourselves to a bag of chips and a cold beverage on the edge of the locks. Although not the one we had planned, what a trip, I’m going to be busy plotting my highlights on Komoot for a while! And may I add, zero flats and zero mechanicals aboard the Escapade, what a bike. Due to the ticks I spent the last night in my car, luckily it’s an estate.